My name is Lauren, and I write fantasy novels. My aim today is to address folks considering entering any of Inkitt’s ongoing novel contests by sharing my experience having my book published through Inkitt. Disclaimer: This post is meant to relay my own experience with one of Inkitt’s contests, and is not meant as a “guideline” of how to win or how to get published. I first heard of Inkitt through a PM via Fictionpress, where I’d posted the first five or so chapters of Catalyst Moon: Incursion years, (and several revisions), ago. It sounded intriguing, if slightly dubious in a “too-good-to-be-true” sort of way, but I thought, “why not?” and entered the most current version of my novel in the contest. Per Inkitt’s suggestion, I shared my story on my various social media platforms, (only Facebook and reddit, at that time), and asked my friends and family to “vote” for my story. In my mind, my book was solid so my chances were good; I was hopeful. But because I strive to be pragmatic, I tried to moderate my expectations to avoid any disappointment should I not win. Erin Swann’s lovely Rising Sun won the contest and the publishing deal, and I was more than a little deflated, to the point where I wanted to throw in the towel, delete my novel from the site and give self-publishing a shot. But lo and behold, Inkitt had another contest in the works; Dreamlands was geared for fantasy books, so I took another shot. This time, I scored. Even after I’d signed the contract, it was impossible to believe that a dream I’d harbored for the 20+ years I’ve been writing fiction was going to come true. Since I started writing Catalyst Moon: Incursion, back in September of 2012, it’d gone through a lot of revisions and rewrites. At the time of my contract with Inkitt, the story was also undergoing its second beta-read; beyond that, I knew much work needed to be done before it could be publishable. My biggest concern was that Inkitt would not allow me to make these necessary revisions prior to publication in favor of publishing the version on their site – the version that won the contest. I made my concerns clear and Inkitt said “Do what you need to do to be proud of the finished product.” We agreed upon a deadline and I got to work. During this time, several Inkitt team members contacted me regarding the book cover and setting up the initial marketing materials. (Blurbs, synopses, teasers, etc.) I consulted with Inkitt’s graphic designer on the cover, which wound up being totally changed, (for the better), later on. Of course, I also edited, rewrote, revised, and fretted until I turned in my manuscript – a week early! Things were slow for a month or so, but picked up speed in the springtime. I had a rough estimate of when my book would be published, (summer of ‘16), but didn’t have a concrete idea until around May, when Inkitt’s director of marketing began to meet with me via Skype about once a week. With his help, I set up a professional Facebook account, a Twitter account, a Goodreads author page, and a pretty neat website. He taught me what hashtags were and how to use them, and advised me on a posting schedule. I have to admit, this was the most daunting part of the whole “published author” gig; this was the part I always knew I’d hate. But Inkitt’s team was highly motivated and I soon felt confident that I could at least figure this stuff out, if not excel at it. During this time, Inkitt had been hard at work on my behalf. 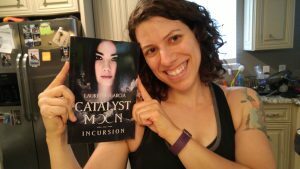 Not only did they test the book cover with different audiences to see how it looked and felt to potential readers, they contacted book reviewers and book bloggers in an effort to give Catalyst Moon: Incursion a head start on that ever-important review/ratings obstacle course. I don’t know exactly how many people they contacted, only that it was in the hundreds. I do know that I never could have or would have done it on my own. Talk about daunting! While all this was going on, Inkitt’s editor had my manuscript in her capable hands. Thankfully, after several rounds of beta-reads and revisions on my part, the book didn’t need a ton of work, just some polishing. She and I did debate a few points, but worked them out until I was confident that my novel was the best it could be. I wasn’t quite ready to release it into the world, but nevertheless, a date was set and I tried to prepare myself both emotionally and mentally. My emotional journey throughout this process could make a series of lengthy blog posts, so I won’t go into it here. However, I will say that this experience has taught me more about myself than I ever imagined; good, bad, and everything in between. It’s all good. Inkitt has worked, (and continues to work), damn hard for me and my little book; I never once doubted that they were trying as hard as they could to make this a successful endeavor for everyone involved. While Catalyst Moon: Incursion remains a minnow in an ocean of other epic fantasy novels, the reviews have been favorable and I’m pleased with Inkitt’s process. I think that, since mine was the first novel they published in-house, they’ve learned from the experience, as I have, and have adapted their process accordingly. What’s to come? Well, at the time of writing this, my novel has been submitted to BookBub in hopes of getting featured; if not BookBub, then we’ll try another similar promotional program. I’m also busy working on Books 2 and 3 of my series, both of which are included in my contract, so expect more content from me in the next year or so. Naturally, I follow Inkitt pretty closely on social media. I’ve seen comments disparaging their publishing model and the royalties offered in their contract. This is all understandable; I once felt as those skeptical folks did. Prior to signing the contract, I questioned the founder and CEO, Ali, at length about all of that stuff. Ultimately, I decided the reward far outweighed any risk and I’m glad I made that decision to trust Inkitt. While I don’t know the exact dollar amount spent on publishing and promoting my book, Inkitt is offering a budget of $6,000 for winners of their current contests. I don’t know about you, but I don’t have six grand laying around to spend on anything, let alone promoting my fantasy novel. I also work full time and occasionally have to sleep, so I can’t spend every moment on promotion, which is pretty much what Inkitt did. At the time of writing this, I haven’t received any money. I think that’s in part due to the fact that Amazon pays out earnings once per quarter, but of course, I have to wonder if I ever will make any money from this book. It’s not a question that keeps me up at night, (I didn’t start writing fiction to make cash and become popular), but it is something I think about. And in general, it’ll probably take me a good five or ten years to gain any sort of notoriety in the saturated market for speculative fiction. So far, I’ve spent a total of $50 to get my novel published. (That was on the headshots, which I needed to get done anyway.) For that $50, I have a novel on Amazon with reviews in the triple digits, a following of readers eager for Book 2 in my series, a contract for three more books, an email list that grows daily, and a feeling of accomplishment and pride unlike any I’ve ever known. So if I don’t even make that $50 back, I’m still victorious. TL;DR: Inkitt’s the “real deal,” folks, and dreams do come true. Thanks for this post! So, is Inkitt kind of like Wattpad, where you post it for people to read, but in this instance, if it does well, they’ll publish it? Is that how that works? That’s kind of what I’m understanding from their website. I’m not super familiar with Wattpad, but I believe the setup of posting stories is similar. Inkitt also hosts writing contests; these are how they choose books to publish. I think it’s a combo of an algorithm that tracks reading habits, (Amazon uses something similar), and reader comments/reactions/votes. So, 6 months later. has your experience with Inkitt proved to be what you hoped?